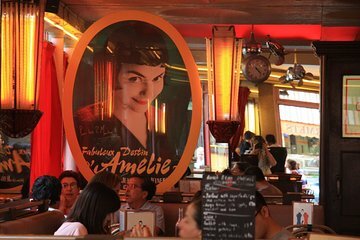 Esplora Montmartre, il quartiere parigino adorato da cineasti, star del cinema, locali e turisti, in questo tour a piedi di 2,5 ore. Scopri le scene di Midnight in Paris di Woody Allen con una passeggiata nella Basilica del Sacro Cuore; stare di fronte al Moulin Rouge, dove Christian e Satine si innamorarono nel film del 2001 con lo stesso nome; e passa dal Café des 2 Moulins, che compare in "Amelie". I numeri sono limitati a solo otto persone in questo tour di piccoli gruppi. We saw so much of a part of Paris we probably would not have visited and thoroughly enjoyed. As promised, Olga keyed the tour around the many movies filmed in the area, while giving us history and interesting facts. The beautiful views and lovely parks and housing as we worked our way up the hill were delightful. All six of us agreed it was a very worthwhile tour. This tour did not live up to the pre-tour hype it was not a tour around movie making with the exception of one film. I am not sure what this tour was suppose to do other than walk around the streets of Montmarte. Whilst the tour guide was very knowledgeable, it just did not match expectations and was almost a waste of time. Our tour guide was awesome! Everyone said this was the seedy part of Paris. We started at the seedy part, was not rushed and as we climbed higher and higher up to Sacre Coeur, it became the best part and loved the artists up there and all the little shops and eateries we saw as part of this tour. Thoroughly enjoyed it, a quick way to see another area of Paris. Thanks Viator. Wonderful guide, amazing tour.. thoroughly enjoyed it but do watch out for the gypsies! Our tour guide took very good care of us in this respect :) Such a buzzy place with so many stories.. Discovered Montmartre like I never have before... Tour guide was brilliant!